Complete Natural Gas Power Generation Plant in new condition with only 1300 hours of operation, equipment manufactured in 2012. 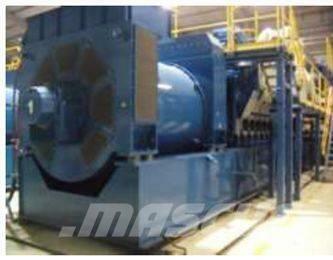 Plant has (13) 9730 KW Wartsila 20V34GS Natural Gas reciprocating engines with AVK Alternators, Fuel Natural Gas, 11 KV, 50 HZ, Siemens Steam Turbine Heat Recovery Boiler, Exhaust system, Cooling system, Lubricating Oil System, Control system, Monitoring System, Electrical System, Transformers, Pumps, Air System, Exhaust Gas System, Compressed Air System, tanks and much more. Complete plant is barely used in New condition with only 1300 hours. This exceptional 140 MW Wartsila Plant is being sold below the cost of New with a substantially financial loss to owners. The plant will not disappoint any serious buyer. Contact us to set up an inspection on this great opportunity to purchase a plant in this condition.